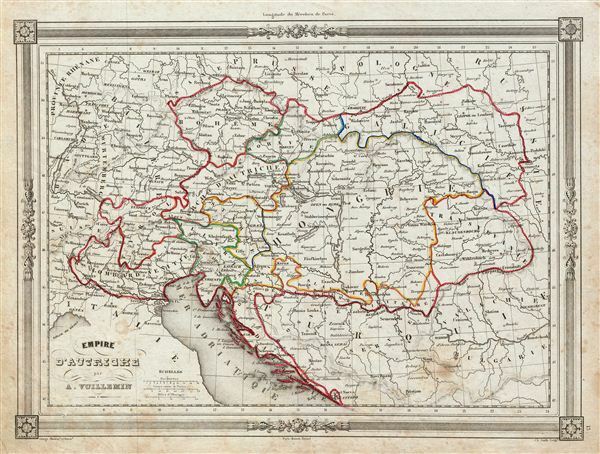 An uncommon and extremely attractive 1852 map of the Austrian empire. The map covers the territories claimed by the once vast Austro-Hungarian empire, including in whole or part the modern day nations of Austria, Hungary, Germany, Italy, Albania, Croatia, Romania, and the Czech Republic. Also includes parts of Turkey, Switzerland, Germany, Russia, Prussia and Poland. Throughout, the map identifies various cities, towns, rivers and assortment of additional topographical details. The Austrian empire, founded in 1804 by the last Holy Roman emperor, Francis II, lasted only till 1866. It was transformed into the Austro-Hungarian empire after Austria was defeated in the Austro-Prussian War of 1866. The map features a beautiful frame style border. Prepared by A. Vuillemin for publication as plate no. 13 in Maison Basset's 1852 edition of Atlas Illustre Destine a l'enseignement de la Geographie elementaire.